The Units 12-14 Project originally existed as five industrial storage units sited at the back of an industrial site in the centre of Belfast. The units were constructed adjacent to a listed red brick church on one side and residential properties on another with little exterior space between and around the units. The units were constructed of concrete brick with only a large roller opening and some small windows for light. Our client required flexible open office space which could be split into approximately 500m2 units if required. The existing buildings were run down and of low quality construction which suggested complete demolition and new build on the site. 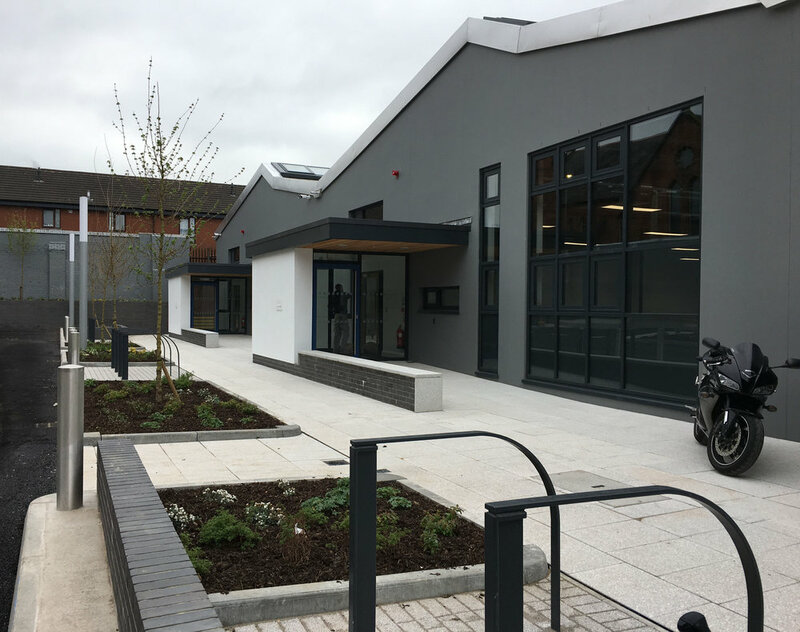 Having analysed the buildings and site layout we felt that there was an opportunity to utilise the existing large high ceiling spaces within the units and expose the steelwork frame and blockwork walls to retain the history and industrial character of the buildings. We strategically demolished two of the units to create amenity space and expose the main warehouse elevations. This enabled us to punch large glazed areas into the gables of each unit and construct new entrance porches giving a human sense of scale to the large units. To allow ventilation and light into the centre of each unit we decided to install openable rooflights along a large section of the ridge line. Utilising an acoustic metal deck roof we were able to expose the internal block walls whilst creating an acoustically and thermally comfortable place to work; the large volume and height created also allows for a more aesthetically pleasing environment.